Almost every day for 35 years, Arthur Stace spent hours writing a single word ? 'Eternity' ? on and around the streets of Sydney. Sometimes his mission took him much further afield, to country New South Wales and even to Melbourne.Stace's identity was a mystery for more than two decades. Then, after his ?unmasking? in 1956, he became a reluctant folk hero. By the time he died, in 1967, his was a household name and the word Eternity was ingrained in the soul of Sydney. It still is.In this long-awaited biography, the full story of Arthur Stace's life is told for the first time in vivid and often surprising detail. Drawing upon many original sources, some never before made public, this book will engross Christians and non-believers alike ? anyone who loves a great Australian story. 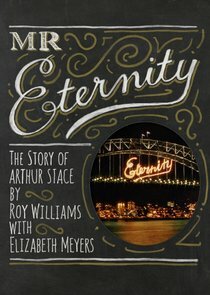 About "Mr Eternity: The Story of Arthur Stace"
One of Australia's emerging public intellectuals and writers, Roy Williams' distinguished 20-year career in the legal profession was cut short in 2004 when he experienced a life-changing illness. Forced to leave the law, he took time to recuperate before deciding to become a writer. His book reviews appear regularly in The Australian and The Sydney Morning Herald. He also contributes to Australian Literary Review, Dissent and Inside Sport, he recently authored God Actually.